Sean Lennon has come to the defense of his mother, Yoko Ono, over her decision to permit the video image of John Lennon and his disembodied voice to be used in a television ad for the French automaker Citroen. "She did not do it for money," Sean Tweeted. "Has to do w hoping to keep dad in public consciousness. No new LPs, so TV ad is exposure to young (sic)," he posted, before adding: "Look, TV ad was not for money. It's just hard to find new ways to keep dad in the new world. Not many things as effective as TV." In the commercial for Citroen's "anti-retro" DS3 model, Lennon, in video footage taken from a 1968 interview but with the audio from a later date, says, "Once a thing's been done, it's been done. So while this nostalgia, I mean for the '60s and '70s, looking backwards for inspiration, copying the past, how is that rock 'n' roll? Do something of your own, start something new. Live your life now." In his Tweet, Sean also writes, "Having just seen ad I realize why people are mad. But intention was not financial, was simply wanting to keep him out there in the world." That Sean would stand up for his mother is certainly admirable, but we have to question whether John Lennon needs help in being kept "out there in the world." 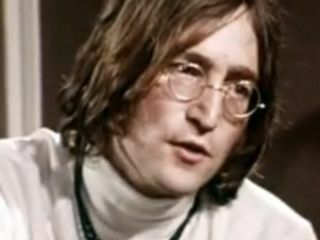 With the release last year of the highly successful remastered Beatles boxsets and The Beatles: Rock Band game, we'd say the spirit, music and image of John Lennon are all with us.